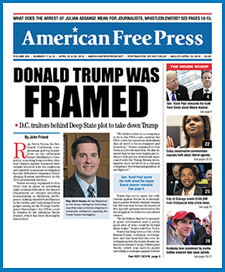 “Reporter Assassinated?” was AMERICAN FREE PRESS’s Issue 27, page 1 story describing the mysterious “accident,” just before investigative journalist Michael Hastings was going to go underground to avoid government agents trying to silence him. There is new information uncovered by AFP’s investigators, however, that tells the chilling rest of the story about the latest weapons in the Obama administration’s war on journalists and whistleblowers, who have the courage to tell the truth. Now, another brave whistleblower has come forth. He is Richard Alan Clarke, the former National Coordinator for Security, Infrastructure Protection, and Counter-terrorism for the United States, serving under Presidents Ronald Reagan, George H.W. Bush, Bill Clinton and George W. Bush. According to Clarke, the car crash, which occurred on June 18, was “consistent with a car cyber attack.” There is reason to believe that intelligence agencies for major powers—including the U.S.—know how to remotely seize control of a car. “What has been revealed as a result of some research at universities is that it’s relatively easy to hack your way into the control system of a car, and to do such things as cause acceleration when the driver doesn’t want acceleration, to throw on the brakes when the driver doesn’t want the brakes on, to launch an air bag. . . . You can do some really highly destructive things now, through hacking a car, and it’s not that hard. . . . So . . . I think whoever did it would probably get away with it,” Clarke said. Modern vehicles consist of between 30 and 100 embedded control units [ECUs], essentially small computers . . . designed to allow microcontrollers and devices to communicate with each other within a vehicle without a host computer. Researchers from [the University California, San Diego] and the University of Washington showed they could take over all of the functionality of the car that’s controlled by software. And in a modern automobile, that’s pretty much everything . . . breaks . . . acceleration . . . even the steering. [There are] a variety of ways of [remotely controlling a target vehicle] without physically touching the car. These attacks involved infecting the computers and repair shops . . . or hacking into the blue tooth system, or using the cell phone network [or GPS, OnStar, etc.]. The most ingenious attack . . . used the stereo system in the car. The researchers were able to craft an electronic version of a song that played just fine in your household stereo system or on your personal computer. But when you put that on a CD and played it in the car CD player, it took over total control of your automobile. Yeah right—pretty scary, huh? ECUs are the ubiquitous targets of Stuxnet, Flame and other computer malware designed by Israel and the U.S. to control and destroy vehicles, electric power plants, water and sewage systems, airplanes, drones—everything. Your only defense against Big Brother’s plots is courageous whistleblowers, journalists—and, in the words of Washington—Divine Providence. Akin to the highly suspicious “suicide” of freelance journalist Danny Casolaro on August 10, 1991, the June 18 late-night death of Rolling Stone investigative reporter Michael Hastings is arousing similar doubts. Only hours after sending a panicked email warning that the feds were interviewing his close friends and associates, Hastings died in a fiery auto accident on a Los Angeles residential street. Most curious about this incident were reports that the engine block of Hastings’ Mercedes C250 had been located approximately 150-180 feet from his car. That same day AFP also spoke with accident reconstructionist Shawn Gyorke of a company named Crash Data Services. After describing how the Mercedes C250 ranks as a top pick by the Insurance Institute for Highway Safety, Gyorke broached the topic of an engine being ejected such a fabulous distance. Unless—as various researchers have speculated—some type of missile struck Hastings’ vehicle. Equally incredulous were circumstances surrounding the demise of Mr. Casolaro. As revealed in HILLARY (AND BILL) THE MURDER VOLUME, Casolaro’s body was discovered in a West Virginia hotel room. His arms and wrists had been sliced at least a dozen times, with one of the slashes severing a tendon. Trying to unravel what he referred to as “The Octopus,” Casolaro pried into the shadowy realm of JFK’s assassination, Golden Triangle heroin trafficking, George Bush Sr.’s October Surprise and its relation to Iran-Contra, Mossad spy networks, and the BCCI bank scandal, among many other related subjects. As a way of shifting blame away from murder, authorities have posited that Hastings’ Mercedes may have experienced technical difficulties or that he suffered from a medical condition. Other reports cited Hastings’ alleged history of drunken driving. However, in a 2012 book Hastings confessed that he hadn’t consumed alcohol in 10 years. Moreover, mechanics that have weighed in on this case insist that automobiles today almost never explode into fireballs. Was Hastings’ Mercedes tampered with or struck by some type of drone or projectile in order to create a sensationalized Hollywood movie effect? Possibly so, especially since Hastings, reminiscent of Casolaro, was working on articles whose tentacles stretched in dangerous directions, such as lawsuits against the Department of Defense and FBI, Gen. David Petraeus’ affair, a whistleblower associated with the group Anonymous, and Obama’s current CIA Director John Brennan.